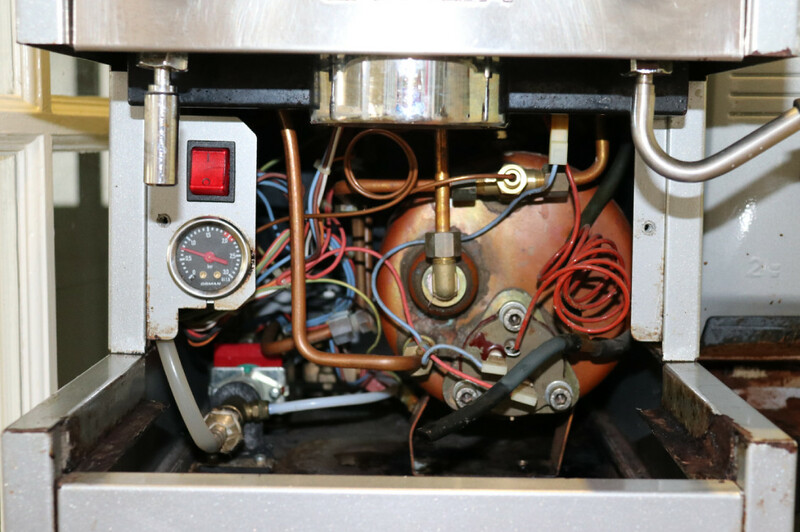 ← Gaggia TS Not Heating – Controller or Pressure Switch Fault? Whilst investigating a strange coffee leak recently, I found you can easily remove the front panel of the TS, presumably to allow changing of the heating element. Just a couple of screws to remove and the panel comes out easily. You need to turn the power off of course, and feed the rubber hose through the panel whilst tilting the panel at quite an angle. Here you can see the boiler, with the heating element held in by three allen screws. The red coil on the right is the overheat thermostat, which has a vial inserted into a pocket in the element. There are three copper pipes connected to the boiler in this view. The lower one is the hot water outlet, which is connected to the hot water tap. The top one is the steam outlet connected to the steam tap. Finallly, the middle one connects to a larger tube which runs through the boiler and acts as a heat exchanger, with the pump providing high pressure cold water that runs through this tube collecting heat from the boiler and feeding the group head with high pressure hot water at about 98C. The boiler is probably at about 120C to provide the necessary steam for the wand. Also connected to the tee for the wand is front panel pressure gauge, which normally reads around 1.5bar when the boiler is up to pressure. The final tube connected to this tee is the one to the pressure switch and air release valve. The pressure switch turns off the heating element when the boiler is up to pressure. The air release valve conversley lets air into the boiler when it cools and automatically closes when the water in the boiler reaches atmospheric boiling temperature (100C) and so the boiler vessel is sealed and can increase in pressure until the pressure switch cuts of the power to the element. On the left, you can see the red water pump (normally an Ulka EX5 or EP5). The silicone tube on the left is relief hose from the Over-Pressure Valve (OPV), which reduces the pressure from the pump from a maximum of about 15bar down to 10bar which is better for coffee extraction. The brass nut the hose is fixed to is a mod for the black plastic elbow which is normally seen here, but is prone to breakage after time. Have a gaggia TS one. The steam wand seems to be stuck on the “ON” position. So won’t build up any pressure as continuously steams away. Do you know what the problem may be.